On a personal level, the influxes in modern multimedia possibilities give us chances to be more connected and engaged with our friends, family, and larger networks. And on a professional level, money and resources can be handled almost at the speed of light, all around the world, with the touch of a few buttons. And whether or not you’re using a dedicated e-learning software solution, the multimedia aspect of virtual education specifically means that audio, still pictures, and video are now all fair game for getting messages from you toward your end-goal partners. 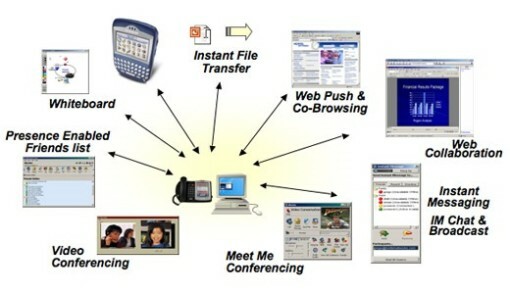 Five pieces of this puzzle that are constantly be analyzed and improved on include business phone systems, group video conferencing, social media options for people on the go, mixed media via cell and tablet over wi-fi and LTE, and even cloud communication as a central meeting area for users. On the business side, you can use the capability of a DX650 or similar system, where typical landlines are not required, video transfer is available, and the amount of space the core apparatus takes up is absolutely minimal. And if you’re a larger corporation, having units of this type will ensure a consistency between different offices around the world, so troubleshooting and tech support will be a breeze after the initial install and some general testing is completed. “Back To the Future” and many other sci-fi books weren’t too off with their predictions of this kind of communication technology available! Group video conferencing is already becoming a standard practice of multimedia communication as well, and in small to medium-sized business operation, by using a service like Skype, it’s even free! These group media conversations are efficient, practical for transferring files, and socially important as well, as real voices and faces can be matched to different business situations. Group conferencing like this not only has the benefit of the face to face feel, but because everyone is at their home computers with hard drives attaches, data transfer is nearly instant, or at least links are immediately available to everyone in on the conversation. Social media apps are presenting interesting options as well for personal and business use in the multimedia realm. Three of the more mainstream ones that you’ll see around right now include Twitter, Snapchat, and Periscope. Each of these platforms has room for real time versions of video, audio, and text, as well as options when it comes to archiving and playback. If you learn to use Periscope in particular, you’ll be jumping onto a concept that has major potential for establishing real-time social clout mixed with professional reasoning behind certain events that can be shared immediately and live to interested parties. And mixed media on the go via your cell phones and your tablets is becoming an interesting and vital part of modern communication as well. For friends and families, there are ways to send photos, videos, and text either to individual or groups, and some apps even all you to arrange them with music and stream them from a central site. It’s not unusual for people to communicate along all of these structures many, many times per day in order to fully express themselves. Add the idea of sending links to other reference sources as well, and you have the most complete way of talking the world has ever seen, all the in palm of your hand wherever you go. Cloud communication is another way that new technologies are coming together in the mixed media realm. There are virtual whiteboards and meeting rooms in the cloud, where people can virtually gather to share audio, video and text in something like a brainstorming format, and it’s even recorded in a way that people can go back in time to see how the overall end result was formulated over streaks of time.